Dell has unveiled its new top-of-the-range 34” curved monitor for consumers. The new UltraSharp U3417W display has the same WHQD resolution as the U3415W introduced a year ago, but increased curvature and a new chassis design. The monitor is aimed particularly at users who do heavy multitasking but do not want to install two monitors on their desks. Nowadays, the majority of display makers position their curved monitors primarily for gamers and multimedia enthusiasts, thus, trying to incorporate very high refresh rates along with dynamic refresh rate technologies like AMD’s FreeSync or NVIDIA’s G-Sync. 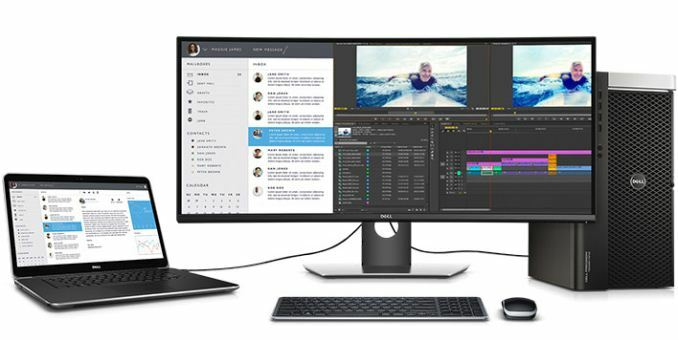 Meanwhile, Dell, quotes IDC’s findings that professionals from many industries (including those, who do finance, accounting and creative work) can benefit both from ultra-wide 21:9 aspect ratio as well as curvature. As a result, Dell offers curved monitors specifically tailored for professionals. Back in April, 2015, the company released its first U3415W curved display and this month it unveiled a newer model, the U3417W. The Dell UltraSharp U3417W has higher curvature than its predecessor: 1900R vs 3800R. All the other specifications are generally similar: an IPS panel with 3440×1440 resolution, 1000:1 contrast ratio, 300 nits brightness, 178°/178° viewing angles, 5 ms response time in fast mode and a 60 Hz refresh rate. 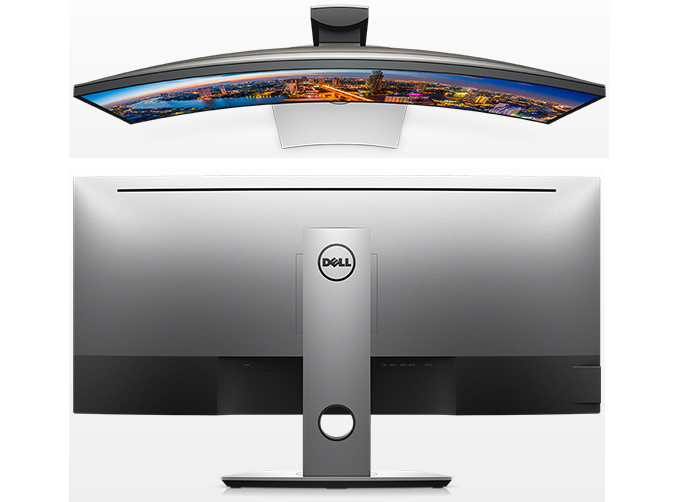 Dell believes that slightly higher curvature will further improve professional productivity. When it comes to connectivity, the UltraSharp U3417W resembles other modern monitors from the company (e.g., the UP3017) designed for professionals as it supports two HDMI 2.0, one DP 1.2, and one mDP 1.2 inputs. For convenience, it has one DP 1.2 output with MST to for daisy-chaining to another display. Besides, the monitor also supports PBP and PiP features when connected to two PCs. Finally, it has a quad-port USB 3.0 hub with two receptacles supporting BC 1.2 charging as well as two USB Type-B upstream ports (to connect to two different computers). 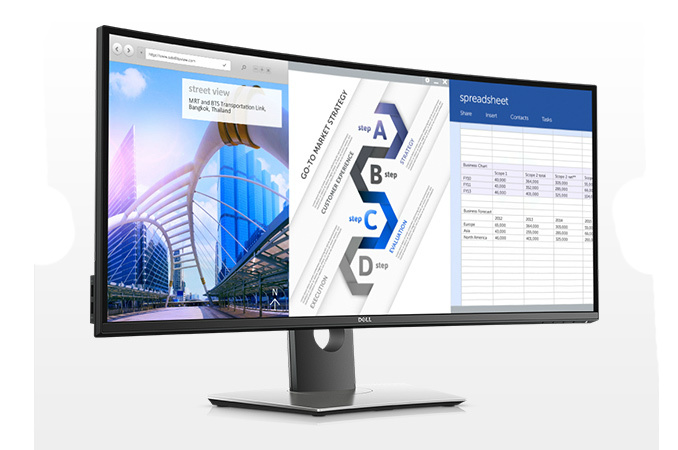 The Dell UltraSharp U3417W curved display is available now for $1199.99 from the manufacturer. Meanwhile, the older model, the U3415W is now available for $899.99. It is unknown whether Dell will keep selling both models, but for now the previous-gen display is available for the price, which is $300 below its original MSRP. Glad to see the form factor getting enough love that they're updating already. I've got the U3415W and it's an utterly fantastic monitor for work. Great screen, and the USB hub tying the two USB inputs to different video inputs makes switching between multiple computers incredibly convenient. I love my U3415W as well, both for productivity and gaming; the extra immersion in simulation games and extra display space in most others that support 21:9 make it more compelling than 4K, IMO. You must be seeing things. Having a curved screen is a gimmick with no actual, as far as I've read, real science behind needing one. Sure, it might look nice, but I'll stick with a flat AOC Q3477 (3440x1440). Curved monitors are much more useful than curved TVs. Because the user is sitting much closer to them, the curvature has an effect in making the screen equidistant, which can help the user see small details. Because more ports, including 2 with USB fast charging and the ability to daisy chain displays? Decision really only depends on what you value more, the former or whatever the Predator offers. They both seem different enough to me to warrant a place in the market.